This week I’ve been focusing on eating my veggies, especially ones that I don’t eat much of. Celery is one of those things. I tend to only use it in soups, but its one of those great veggies that is full of vitamins and fiber. Much to my surprise, it’s pretty damn good mixed with fruit. Waldorf Salad is one of those recipes that freak me out also because of the mayo that’s used. Mayo + fruit + celery just doesn’t seem right. Luckily this recipe swaps out the mayo for Greek yogurt, and it’s a great snack to have later in the morning around 11a when your stomach starts craving lunch a little early. 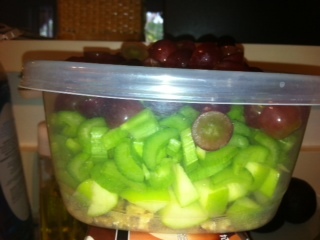 Throw the celery, apples, walnuts and grapes into a large tupperware. Squeeze the lemon into the container of yogurt and stir it well. Add the yogurt to the other ingredients, snap on the lid, and shake furiously to mix everything together. Keep chilled until you’re ready to serve. 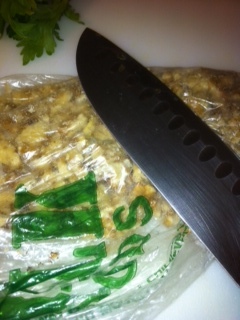 Pro tip: Keep the walnuts in a bag and when you’re chopping them, take the back of your knife and smash them with your palm instead. This will keep them in one place, and when you’re ready to add them, just pour them from the bag. Less mess! I’m pretty sure this is my favorite take on lentil soup. It’s just the right amount of broth, the lentils haven’t soaked up all of the liquid, and if you keep your veggies roughly chopped you’ll end up with a hearty, rustic soup. Split pea soup should be creamy in my book, but lentil soup should have lots of texture. For only using a cup of lentils, this recipe actually yields a good amount. Freeze extra in bags or containers and reheat later when you don’t feel like cooking or for an easy lunch. 1. 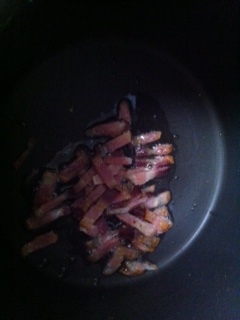 Brown the bacon in a heavy pot until crisp on medium-high heat. Add the onion and sauté until the onions are translucent. 2. 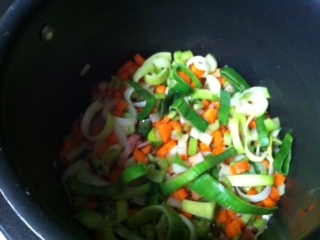 Add the leek, celery, carrot, rosemary and bay leaves. Stir everything to coat with the bacon drippings, and cook 3-5 minutes. 3. Add the canned tomatoes (juices included) and the stock. Bring to a simmer, then cut the heat down to medium-low. Cover the pot and simmer for 2 hours. 4. Season to taste with salt and pepper. Serve hot with crusty French bread!